It's unfair to compare and contrast the two Lead Claimants who were cross-examined in court today. They are two individuals who do not deserve to be lumped together, simply because they happened to be in the witness box on the fourth day of this trial, but it's almost impossible not to. There is a pattern to their experiences and a pattern to the way they were cross-examined, but they brought wildly different styles to the witness box, even though the story they were telling was essentially the same. It was actually a reminder that this is about individuals, fallible human beings with ambitions and hopes and fears. And when I say that, I'm talking about both the claimants and Post Office staff. First up was Naushad Abdulla, a former Subpostmaster in Charlton, South East London. Mr Abdulla took over his branch in Jan 2007 and was sacked ("summarily terminated" in his words) after an audit in May 2009 found a discrepancy of £4398.42 in his branch. Naushad was accused in court today of the criminal offence of false accounting. It is a charge he vehemently denies. Naushad's peroration from the witness box today was one of the most unintentionally epic performances I have ever witnessed. And I say that with respect to him, to the QC questioning him (the extremely capable David Cavender) and the judge who had to referee it. The lead claimants preceding Mr Abdulla were Alan Bates, Pam Stubbs and Mohammad Sabir. Each was, of course, their own person, but they all seemed to have an awareness of the way in which the theatre of their appearance in court would play out. A QC asks you questions, you answer them to the best of your ability, and everyone bows down to the mechanics of the legal process. Not so Mr Abdulla. He was neither arrogant nor disrespectful. He didn't seem to come to court to prove anyone or anybody wrong or right. He just had a natural ability to test, and to talk. If you, a QC, in an important trial, are going to ask Mr Abdulla a question, he's going to want to know why you asked him that question and he's going to probe and explore your reasoning, just as much as you are going to want to probe his. Mr Abdulla isn't trying to get one over on you, he just wants to fully understand where you're coming from before he feels he can give you a full and proper answer. To witness this was a privilege. QCs ask very precise questions in which there is inference and import to be understood from each particular answer. Those questions hang heavy with legal meaning, which perhaps might not be apparent to the witness, and the witness is required to answer them as they understand them to be asked. Mr Abdulla did answer those questions, but he seemed to have a very natural ability to take control of the situation through a mixture of natural charisma and a predilection for warming to his theme. What I liked about him best was that he treated everyone in court as his equal, and expected the same in return. The joy of it was watching the judge keep things moving in his courtroom so expertly. He read Mr Abdulla very well, gave him his moment when he thought it merited it, but respectfully brought him to heel when necessary. It was something of a masterclass. If you haven't seen the live tweets of Mr Abdulla's morning session - I would urge you to read them here. Some of the exchanges do have an element of entertainment value to them, but only to the disinterested observer. In fact we were in court, or more particularly, the judge was in court to get a clear understanding of the truth of what had happened to Mr Abdulla around a decade ago. To Mr Abdulla, it was deadly serious. We were talking about a traumatic period when he went from being a sales rep to a Postmaster to a suspect in the space of three years. Mr Abdulla says that time took his confidence away completely. He is currently between jobs. The Post Office's QC started his cross-examination in the way he had with other lead claimants. He used his forensic skills to make clear to the judge just how much awareness Mr Abdulla must have had with regards to the contractual nature of the relationship he was entering into. Mr Abdulla, like many other Subpostmasters, was insistent he never saw the full 144-page Subpostmaster contract. Mr Cavender spent a large part of the morning explaining to him how he must have. This is a tactic which Mr Cavender has deployed with all the former Subpostmasters who have taken the stand so far. It is clearly crucial to the Post Office's case that they demonstrate to the judge that all the Subpostmasters who say they never saw a contract are either lying or mistaken. Otherwise it's difficult to explain how or why Mr Cavender would spend so many hours (and it is, by my estimation, at least five hours now) asking the judge to infer from the available evidence that, in fact, they did. Of course, the simple thing to do would be for the Post Office to produce their copies of the signed 144-page Subpostmaster contract from each claimant. They have not indicated that they have these in their possession. Nor have they indicated that they don't. 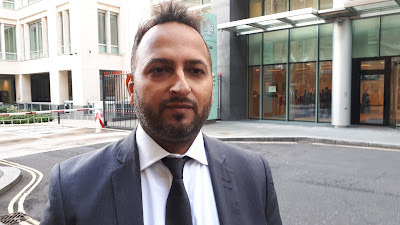 Mr Abdulla said he definitely would have taken legal advice if he'd ever been given a full Subpostmaster contract and told the court that if he had been given it there's no way he would have signed it - he would have had to be mad. "No one would. There'd be no agents left!" Other highlights include Mr Abdulla being asked to confirm that he did sign a summary of various terms within the contract, during which he looked at the document on the screen in front of him in the witness box and pointed out that alongside this there was a section of legalese which said nothing in the document can "be relied on for any purpose". The Post Office QC was really uninterested in that bit. The cross-examination finished with a lengthy discussion about what Mr Abdulla's intentions were about what was in his safe when he was audited and suspended - an inflated damaged notes total and a personal, undated, uncashed cheque for £2,500. Mr Abdulla was warned that Mr Cavender's questioning would be on the subject of false accounting, a criminal offence, and that he was entitled not to answer any question put to him if he felt it might incriminate him. Mr Abdulla was vehement and adamant. He would do exactly the same thing again because he felt he was doing the right thing. Ms Stockdale was a quieter witness than Mr Abdulla, and an interesting case in that her story is not an old one. Her journey from successful person to Postmaster to criminal suspect has happened relatively recently. You can read my tweeting of her session in the witness box here. It's after Mr Abdulla finishes his evidence, further down the thread. As Mr Cavender QC started treading the well-worn path about the sight of the documents Ms Stockdale would have had and signed, and what she understood by them (incidentally, she says she didn't see a Subpostmaster contract either) I got distracted and started reading her witness statement, which had just been released to me. "On 15 October 2014, unexplained shortfalls of £3,640.52 were showing on my Branch accounts. I called the Helpline whose unhelpful advice on this I set out above at paragraph 97.1. "I called the Helpline again on or around 21 October 2014 and again asked for some further training and assistance from Post Office in relation to the balancing problems I was having. David Longbottom [a Post Office manager] came into my Branch on 29 October 2014 to try and work out what was going on. I let him see all of the Horizon records that I had access to. He printed off various documents from the system but he was unable to find out what the cause of those shortfalls was. He said that the problem would be referred to the Horizon Technical Desk, but I never heard any further from Post Office on this. Instead, I had a letter from Post Office on 3 November 2014 demanding payment of £3,640.52, being “the amount you owe to Post Office Ltd."
"I went back-and-forth with Post Office over this and eventually I agreed for Post Office to make deductions of £455 per month from my pay for a period of 8 months to cover the payment that they demanded, Post Office wanted me to do this, and said that I was not allowed to settle any further losses for a period of a year after this has been repaid. I took this to mean I was not allowed to settle further unexplained losses centrally at the end of a trading period. I felt that I had no choice but to agree. I did not understand the causes of these shortfalls and I was still hopeful someone from Post Office would get to the bottom of it. I believe David Longbottom attended the Branch again on 18 November 2014. Although I do not recall the details of this visit I am clear that David Longbottom still did not help me resolve the balance issues I was experiencing. "While I do not remember the date of his visit, I recall a Post Office employee called Gary also visited my Branch in response to the problems I was having with unexplained shortfalls. Gary apparently worked for Post Office and ran three Post Office branches of his own. He was unable to get to the bottom of where the discrepancies were coming from, and his parting advice was simply to “sack all your staff". "In response to what had happened, I introduced a robust paper recording system for all cash movement in my Branch. I required all staff to complete manual till and safe logs which kept track of all cash in the till and safes, what had been paid in or paid out and even the denominations. I refer to some examples of this at [ES1/964-980]. This allowed me to manually reconcile cash in and cash out so that I could always check that the cash position in my branch accounts would be right and that nothing was incorrectly entered. "I also had CCTV installed in the Branch. I trusted the staff and did not believe that they would take any money, but I wanted to be able to have a tight control of all cash in and out and to be able to completely rule out theft from a third party as a reason for the shortfalls. With CCTV and a robust paper recording system in place, I spent hours trying to investigate the reasons behind the shortfalls. In particular, whenever I encountered a shortfall, Darren and I sat down and reviewed the transaction log for that day against the paper recording system. However, we simply could not get to the bottom of why unexplained shortfalls happened - as far as I was concerned, everything should have been adding up." "I generally found the Helpline was dismissive of the problems that I was having. On one occasion, in October 2014, I remember reporting an unexplained shortfall of more than £3,000, which is a lot of money. I remember very clearly that the Helpline operator I spoke to said to me, "what’s the problem, its only £3,000, that’s a drop in the ocean compared to some people’s problems". This I remember because earlier on in the period of my appointment I had been told by the Helpline that I was the only one experiencing these problems, which had made me feel inadequate." And as so many people have done before, Ms Stockdale stops trusting Horizon. She preferred to trust her paper system. When she did put her numbers into Horizon, it threw up an £18K deficit. She was audited. The auditor's investigation concluded "false accounting has taken place." She is now in serious trouble. Mr Cavender, for the Post Office, quizzes Ms Stockdale intently about this. He makes a point which has slowly been crystallising over the last few days - if Horizon throws up a discrepancy which the Subpostmaster disagrees with, they can settle it centrally on Horizon and then dispute it. And, for some reason, says Mr Cavender, Mr Abdulla, Ms Stockdale and Mr Sabir did not do this. This argument has been raging for years. Aggrieved Subpostmasters say that by settling centrally they are taking responsibility for a debt they are disputing if the Post Office decides it is not at fault. They say in reality, by settling centrally, they are delaying the inevitable. The inevitable being the Post Office deciding it is not at fault and making the pre-accepted debt theirs. The only other option is settling to cash, which means putting the money into the till in order to balance the account and roll over into the next period. 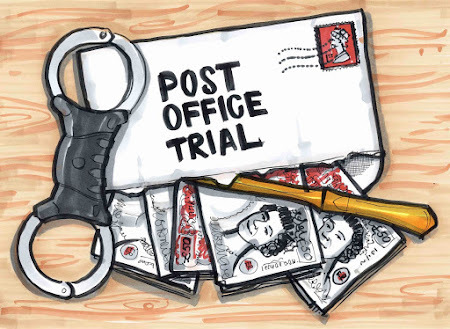 Yet in the stark light of a courtroom, a Subpostmaster's motives for not settling centrally and following a formal dispute process are difficult for them to explain. The accusation of artificially inflating cash balances, even less so. Mr Cavender had no doubt. There was no problem in either of today's witnesses' Post Offices with Horizon. The discrepancies were entirely due to either or both their own dishonesty/mistakes or that of their staff. 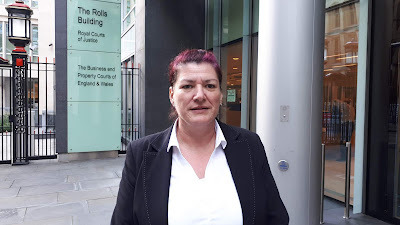 Furthermore Ms Stockdale's exchange with the helpline was a fiction, and Mr Abdulla had impugned his entire credibility to such a degree that the Post Office would be asking Mr Justice Fraser to disregard his evidence entirely. Both Mr Abdulla and Ms Stockdale made articulate and unrehearsed arguments for their innocence, and their firmly-held belief that Horizon was the source of their problems. ... at 10.30am at Court 26 at the Rolls Building, off Fetter Lane, in London, tomorrow. I'll be there. Tweeting. my appointment was summarily terminated. in Schedule 1 of the First CMC Order. 5. Exhibited to this statement is a paginated bundle of documents marked NA1. Health, and from 2002 to 2006 it was Innovex Limited. Post Office over the years. Subpostmaster to be a very secure position and a long term commitment. Post Office and was appointed as Subpostmaster, as I describe further below. been in place during my parents’ time and I did not discuss with them. with Post Office was not before mid-2006. open, which the letter stated could be varied from time to time in writing by Post Office. from Christie & Co prior to applying. documents as ticked on that list. and charges for either breaking the agreement or early repayment. Office asked of me and the guidance in the body of the standard form. success of your business that you investigate its viability before opening for business. yourself, if you are experienced enough, or by your accountant or business advisor. discussed these with my accountant. information from Mr Sandhu and contained in his accounts. working together with me to make the Branch a success. discussed with me at the time. onerous and time consuming. It also had to be completed under some time pressure. and lease were worthwhile commitments. the pre-contract information from Barclays Bank referred to above. appointed as Subpostmaster of the branch. obviously have expected this type of information to come from Post Office. in my interview with Post Office. not able to identify that there was any real loss at all, or how the error had arisen. contract advisor, and Ms Christine Adams, who would become my area manager. that the interview took place on the later date, 22 November 2006. 38. Most of the interview was taken up with Ms Ridge asking me questions. at the interview at some length and Post Office was interested in my sales abilities. alleged shortfalls, I would not have accepted the appointment. these were Post Office’s conditions, which were not open for negotiation. requirement for me to provide not less than 18 hours personal service each week. This document is signed by Ms Ridge. for me to sign and return it. Office in its dealings with me. expect that I already knew about these dates before this letter from Post Office. risks and uncertainty, stress and worry. and working on the live Horizon system. while this took place and was only allowed to enter the branch afterwards. don’t know what the references to “my contract', “book of rules" or “postal instructions"
information about various topics and Post Office products and services, including e.g. know what that would be. now see that the content is potentially very serious. to read and understand this document before signing it. that there were more documents in addition to those I have described above. trainers would tell me what to press on screen. personnel. I was also shown during this time how to conduct a balance. Post Office training provided was lacking. and that I would be able to succeed in this respect. with the trainers, and did not have any way to contact them myself. me. I was not advised of any other help or support offered by Post Office. provided to me in relation to Horizon or balancing. these to be conditions of my appointment. expected they would require me to have kept the property in a good state of repair. was arranged to reflect a new Post Office design or colour scheme. be working together and sharing information. it says would have been sent to me. an engineer, then Post Office would arrange for an engineer to be sent to the branch. understood it was something which Post Office provided to Subpostmasters. investigation, or its approach to suspension and termination. branch and would not have wanted to enter into the commitments I did. know where to look to find the problem or the possible solution. bottom of any problems and to resolve them. request more help with investigating the alleged shortfalls but this was not provided. he just said to go back through my paperwork or call the helpline. out what had happened before requiring me to pay in anything more than minor sums. support I had access to was the general Helpline. these were genuine losses to Post Office. corrections there is no text providing an explanation. than a credit, this cost me £2066. ACCEPT OUR SINCERE APOLOGIES FOR THIS ERROR”. which must also have been an error. now think that one of these was likely an error by Post Office. 99. There is a transaction correction issued on 20 March 2009 for the amount of £960. present (which I explain below). I did not know anything about this at the time. in a way that was potentially very significant. any of the £960 transaction corrections I have referred to above. responsible for the adjusted accounts. Post Office side, and these individuals are able to make mistakes. is illustrated by the 16 April 2009 letter which I refer to below, following my suspension. later issued, and after a period of time I also adopted this practice. 107. There was no investigation by Mr Rodericks as to why there might be this discrepancy. day. I understood I had to do this and that I didn’t have a choice. again I do not think I saw this at the time. that it predates the actual audit at the branch. 111. I found out about the second audit while I was in Dubai, a few days after it happened. the letters was not my address at the time. able to do any investigations into the alleged shortfall amount. caused by an error on Post Office’s behalf. Alliance and Leicester Co-Op cheques for the week commencing 4 March 2009 (i.e. and that I had not seen this before the interview. another Subpostmaster in the last sentence. fair and thorough. This was not my experience as I have explained. financially, personally, and on my health. the branches, which I think he received commission for. document suggesting that she ever did. required to accept on Horizon. resources and data available if it had so desired to carry out an investigation. its case as to the proper interpretation of this clause. them paid by the Subpostmaster. operated the contract in practice. though I knew there was no way they could be correct and I told Post Office this. parties, or errors in the Horizon system that I would not know anything about. she would look into but I cannot see she did. think there was any evidence enclosed because I later had to request this. Post Office was holding me responsible for. now due to be paid", but this was completely unexplained. against you forthwith to recover the sum due together with interest and cost’. explanation to me, which wasn’t clear at all (paragraph 140 above). 143. I do not recall Post Office ever writing to me to say that my contract was being varied. improve my profits, but was reliant on Post Office’s decision to permit it. I believe the contents of this statement to be true.